Geer Van Velde was born on April 5, 1898 in Lisse, a town in the Netherlands. He and his older brother Bram, who was also a painter of note, endured misery and abject poverty, when their father abandoned the family. After being apprenticed to the decorating firm Schaijk and Eduard H. Kramers, Geer moved to Paris to join his brother. Initially Geer was influenced by the Russian born French artist Marc Chagall, who was a pioneer in the art movement of modernism as well as one of the greatest figural painters of the 20th century. Geer van Velde at this juncture painted subjects from nature but then began to experiment with painting works that explored the relationship between abstract geometric shapes. Geer always remained very close to his older brother Bram. An exhibition at the Musée des Beaux-Arts in Lyon in 2010 explored how the two influenced each other in their different and diverging artistic pursuits. Together their art reflected the aesthetic issues that both confronted and revolutionized art in pre and post World War II Europe and formed a part of the École de Paris. Both brothers were intensively influenced by the Cubist movement, a style of painting from which Geer never deviated during his artistic career. Composition is an exceptional example of Van Velde’s late 1950s compositions. The cubist planes, fields and arcs are beautifully synchronized and balanced and can be characterized as one of those canvases where “magic” happens. It also seems to be a rarity for him to use the cross like forms that dominate the center of the canvas but it is part of what creates a visual strength to the work. In addition, there is a lot of color in the work but it cohesively ties together in such a seamless way that the painting reads initially as a “tones of gray” color palette. 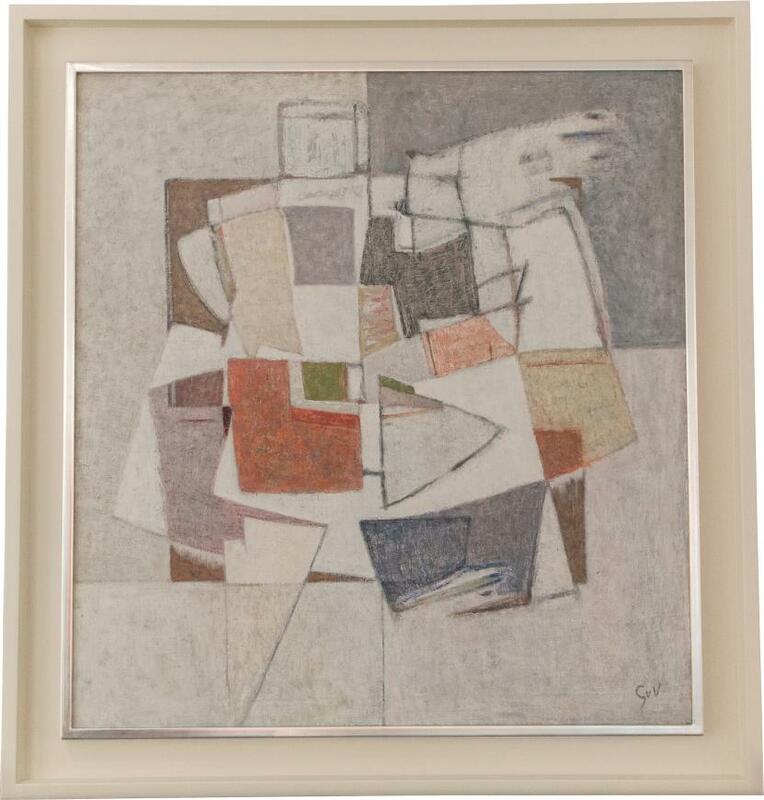 By 1960, Van Velde had moved from painting recognizable landscape imagery to abstract-geometric compositions in the tradition of the French Cubist painter and printmaker Jacques Villon (1875-1963). 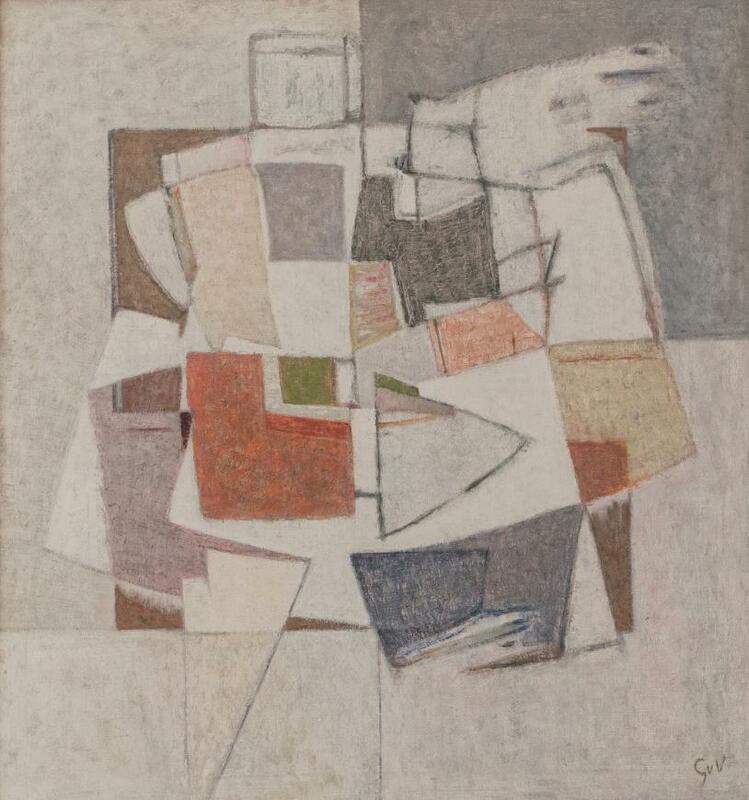 A member of the acclaimed École de Paris Geer Van Velde has applied his distinctly modulated palette of blended grays, charcoals, blues, browns and whites, still reminiscent of his landscapes and figural studies, to define the geometric shapes expertly arranged and balanced across the canvas. The carefully crafted balance of geometric shapes is matched only by the quality of these softly harmonized tones, the unmistakable mark of the assured hand of the former draughtsman who had carefully studied and applied the lessons of Picasso and Braque. Schiedam, Stedelijk Museum Schiedam, Kunst uit huis VI, 2010. Amersfoort, Museum Flehite and Mondriaanhuis, Cobra tot Zero, 2015-2016 (illustrated in colour, p. 29).